As the college application season heats up, colleges across the country look to diversify their student populations both in terms of race and socio-economic status. On September 16, The New York Times released its 2015 College Access Index. The index measures top colleges’ efforts on economic diversity, taking into account the share of students who receive Pell grants, their graduation rates, and the prices that the colleges charge low and middle-income students. Swarthmore ranks 56th on the accessibility list despite having the 6th largest endowment per student, raising concerns of whether the college is truly accessible to low-income students. 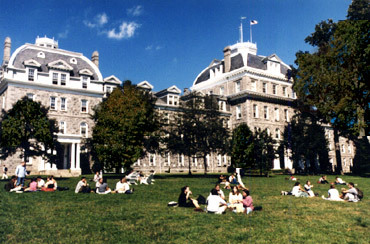 However, Swarthmore disputes the reliability of the index. “The data used by the New York Times is taken from federal sources that don’t fully take into account the full financial situation of students receiving financial aid from Swarthmore and many of its peer institutions,” Vice President of Finance Greg Brown wrote in an email. While Swarthmore financial aid packages are loan-free, 33% of 2014 graduates took out loans at some point during their time at the college, graduating with an average debt of $21,866, according to Swarthmore’s 2014-2015 Common Data Set. Swarthmore’s rank on the index paints a negative image of the college in terms of accessibility, however, the college utilizes different avenues to reach out to low-income students. One example is QuestBridge, an organization that connects low-income, high-achieving students to the nation’s top colleges. Swarthmore has been a partner school for QuestBridge for a few years and has participated in the College Match Program. This program awards a select few low-income students with an admission and a full scholarship to the college. “Our first year we brought in about nine students and this past year, [about] 8% of the Class of 2019 are QuestBridge participants,” wrote Vice President and Dean of Admissions Jim Bock in an email. With the success of QuestBridge, Swarthmore has joined another group, the Coalition for Access, Affordability and Success, to expand on accessibility. “The goal of the coalition is to broaden access to higher education for students who have struggled with financial aid and other elements of the application process and encourage more students to consider college,” said a press statement released by the coalition. With this new application process, low-income students should have an easier time applying to the most selective colleges in the nation. This additional assistance is crucial to attract more low-income students to top colleges in general because low-income students lack the resources to provide them with information about the admissions and the financial aid process. Aside from joining groups, Swarthmore has been doing additional work to reach out to low-income students. This year, the college is joining up with College Greenlight, a community based organization that partners with over 800 organizations nation-wide to connect traditionally underrepresented students to colleges. Additionally, the college created a new Director of Access position, and is offering two Discover Swarthmore programs, said Bock.